2. 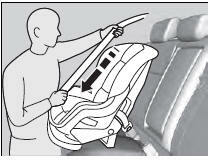 Route the seat belt through the child seat according to the seat maker's instructions, and insert the latch plate into the buckle. - Insert the latch plate fully until it clicks. 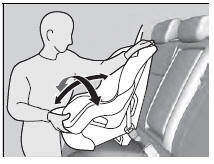 - If you are able to pull the shoulder belt out, the lockable retractor is not activated. 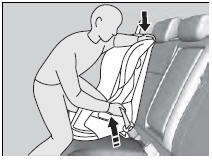 Pull the seat belt all the way out, and repeat steps 2 – 4. 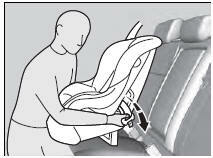 - When doing this, place your weight on the child seat and push it into the vehicle seat.